I was provided One via Net Galley in exchange for an honest review. This does not affect my review. 1) One was not something that I expected. At all. 2) I don't think there was one thing that I didn't like about this book. 3) Poetry in novel form is not something that I delve into all to often and it was BEAUTIFUL. 4) I don't know how any review can possibly sum up my thoughts of this book. One is not just a story about conjoined twins. 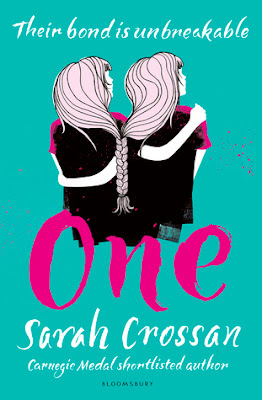 One is a story about family, love, belonging, longing, loss, trust and everything in between. I went into One not knowing what to expect, much like Wonder. I was nervous, but I had absolutely no reason to be because One was absolutely stunning. It's not a sob-fest - well, not the whole time - it's funny, hopeful, blunt and absolutely, breathtakingly gorgeous. I'm struggling to find the words to put into this review. I have no thoughts, only feelings and I have no idea how to do this book justice. One came at just the right time for me. I was in the middle of a pretty deep slump, I'd just finished a book that I gave a 1 star but One pulled me out. It pulled me out and them some. With it's beautiful characterss: Tippi, selfish and hard around the edges, strong willed, passionate, loving. Grace who would do anything for her sister, but who at the same time wishes her sister would do anything for her. Yasmeen. Oh, Yasmeen, you are too precious for this world. Yasmeen is absolutely delightful. She's always up for an adventure, she's unconditionally supportive and she is one of my favourite characters in this book. Now don't go thinking that Yasmeen is a flowers and sunshine type of girl because she's not. I love Yasmeen. And then there is Jon. Slightly pretentious, tattooed, unbelievably gorgeous, Jon. There is a quote that pretty much sums him up and it almost made me cry. 'For the first time I realise that he is not perfect. And I hate him for it'. Between the characters, the writing, the plot and the stunning beginning, beautiful middle and equally astounding end, One is a story that everyone should read. Don't even hesitate before adding this one to your TBR. It's not something that you're bound to regret. Ahhhh! I'm so excited for you to read this <3 I hope you love it as much as I did :) It's definitely one that'll stay with me for a while. Okay, I am super glad that you mentioned that books written in prose aren't usually your thing, because they aren't usually my thing EITHER, so I have been scared about picking up One because of that. But yessss, I am so glad that you liked the prose in this one, and that it was done well. I really like the sound of One, especially because I keep hearing things about how wonderful it is. I especially like the sound of the vivid characters, because cardboard cut out characters are THE WORST.